It’s Hong Kong week here on Brendan’s Adventures. Remember, that at the start of June the format of this blog will change to become far more travel photography focused. Until then, Hong Kong week! 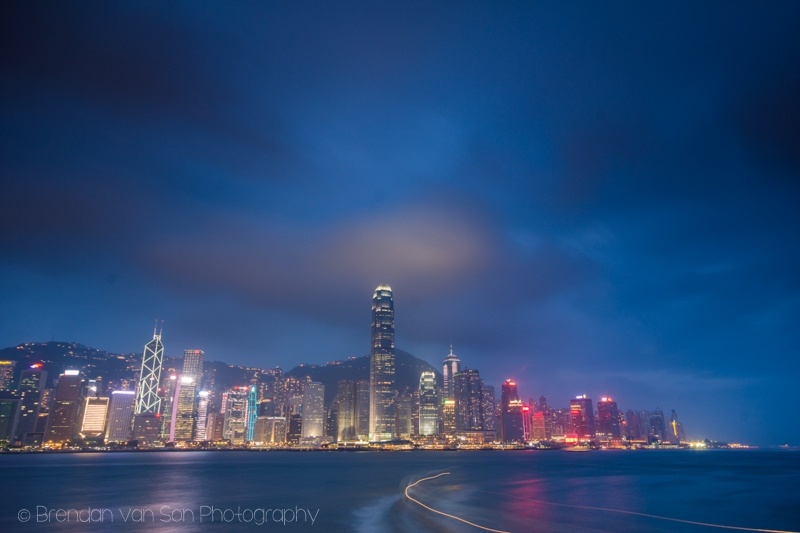 Of all the skylines in the world, Hong Kong is among the best. Sure, there are no defining features to it like the CN Tower in Toronto or the Brooklyn Bridge in New York, however it’s just a clean, cool skyline to photograph. It had been a while since I shot the a really nice skyline, all the way back to Singapore, so I did my best to shoot the Hong Kong skyline from as many places as I could. These are the three spots I shot it, and how I took the pictures. 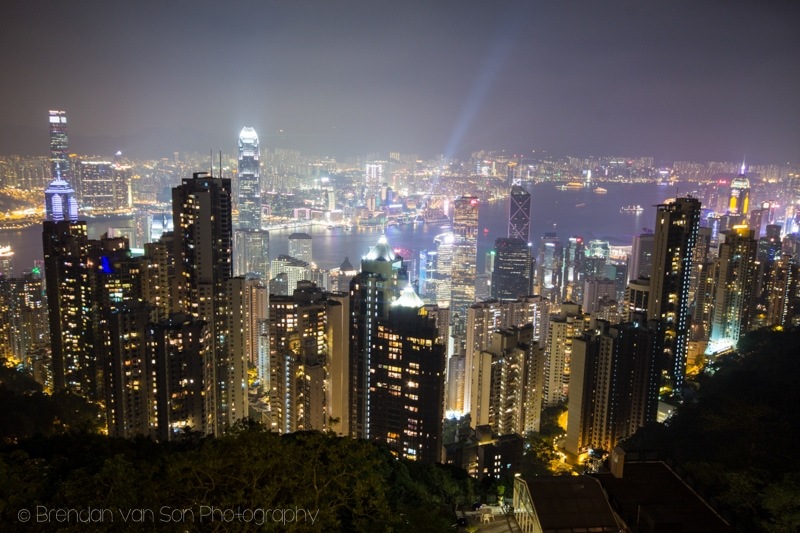 Victoria Peak was the first place I really wanted to shoot in Hong Kong. It’s such an interesting perspective to photograph a skyline from above. Sure, there are places where you can photograph skylines from the top of a building, but I can’t think of anywhere you could shoot a skyline from this high up. 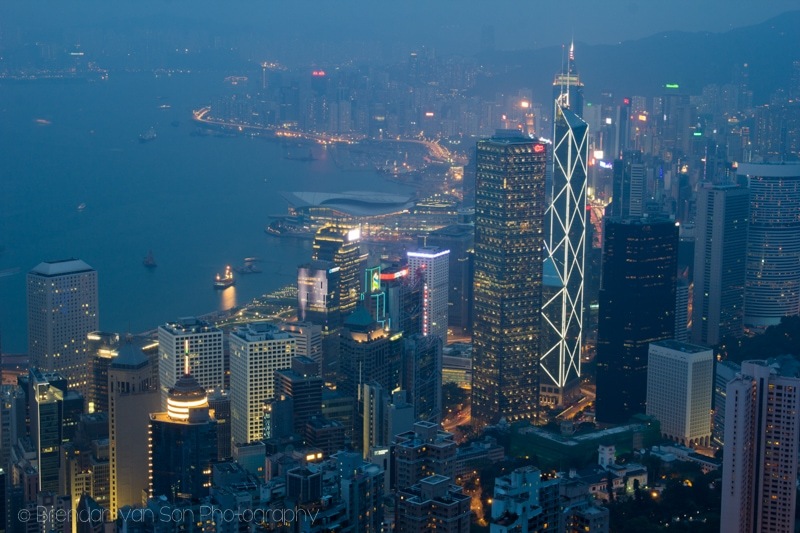 If you want to photograph the skyline of Hong Kong from Victoria’s Peak you have two or three options. For me the best bet is to get out of the tram station and look for the path that leads to the right if the skyline is at your back. Walk along that trail and there are 3 or 4 clean spots you can shoot. You might want to get there early as there are always 5 to 10 other photographers up there too. You can also shoot from the pagoda which is right next to the tram station to the left if your back is to the skyline. However, it gets crowded. If you’re not short on money, you can also take photos from the top of the tram building itself. You get clean lines from up there, but have to pay extra. When the light is bad, try zooming in on the skyline. Too often, we focus on getting the entire scene. 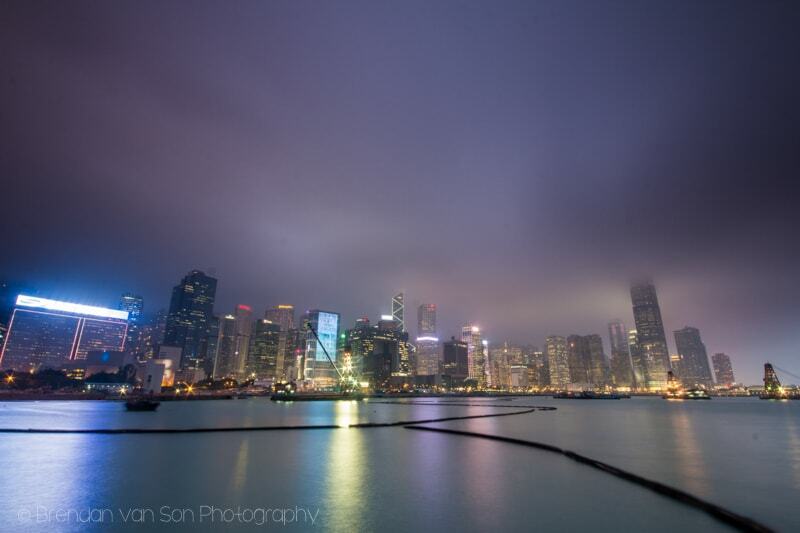 I like to reach into the skyline in places like Hong Kong and try to pick out elements, like I did with this shot. The light was pretty bad when we were at Victoria Peak, just a bit bland. Thus, I really had to work on my composition. I tried to get the entire skyline in on this shot as well as the harbour. Wish the sky was better, but it works. I shot this from the pagoda. It’s OK, but I preferred the scene up the trail from the previous images. Just down from the Renaissance Harbourview Hotel and the ferry crossing is the convention center. If you circle along in front of the convention center there are some cool places to shoot that section of the Hong Kong skyline that are really worthy. You wont get the entire skyline like the other two options, but you’ll have far more opportunities to be creative with your lines. Don’t bother trying to photograph on the ferry side of the convention center as a tonne of boat trips come across there and will ruin all of your shots. Moreover, there is a messy construction scene there at the moment anyways. The skyline over here is cool, and I got good light, but there were a lot of these big barriers put down in the water. They could ruin shots as they moved around and just looked like blobs. Instead of fighting them, I tried to use them to my advantage in this photo. Over at the Convention Center you’ve got this big walkway. I tried to use it as a leading line for my photo. 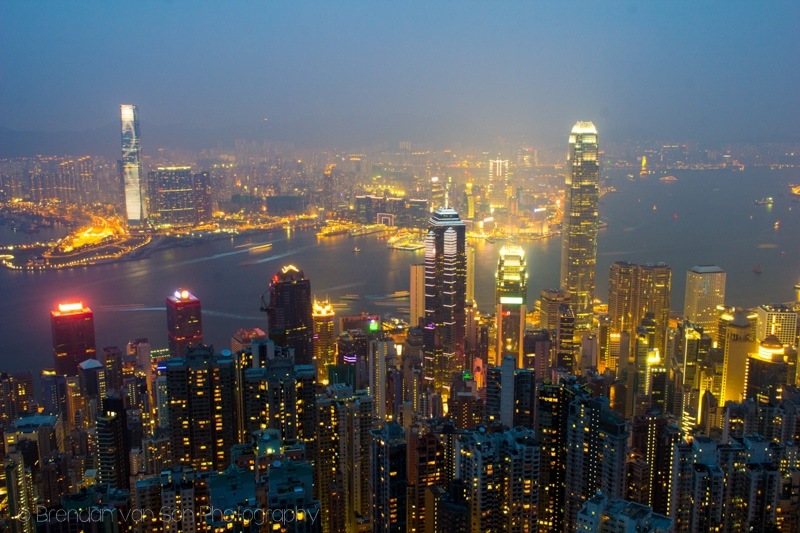 If you’re looking for a really clean, classic photo of the Hong Kong skyline, this is the safest bet. You’re over on Kowloon so you’ll have a straight shot angle over at Hong Kong Island. It’s a big open walkway over there, so you’ll likely have little problem finding a place to photograph from. However, I’d get there quite early as there are countless photographers there every night shooting images, not to mention the thousands of smartphone wielding photographers trying to get selfies in front of the skyline. 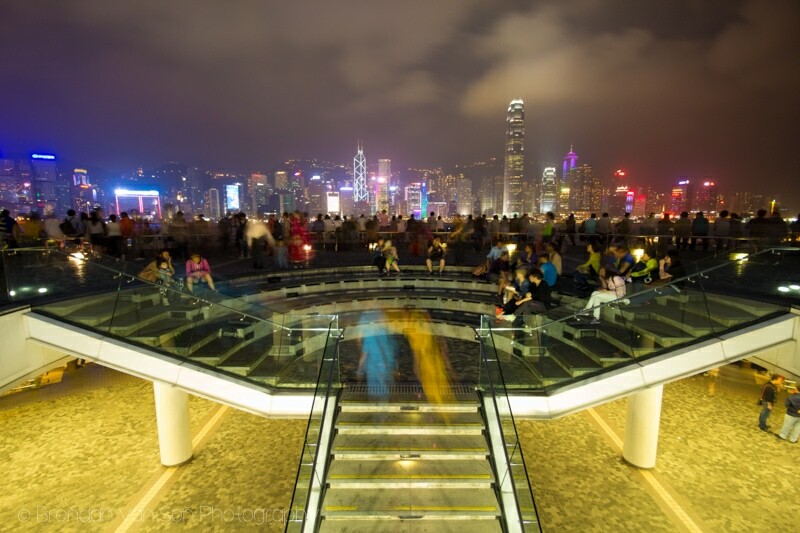 My favourite spot along the waterfront was at the elevated viewing area right near the Tsim Sha Tsui clock tower. However, you have to be patient as there is a lot of ferry movement and their light trails can easily ruin your photos. You’ll also find some nice lines down along the Avenue of the Stars. This is the classic line that you’ll find down at Victoria Harbour from the elevated viewing platform. As you can see by the boat light trail in the foreground of the photo, you’ll have to deal with the ferries crossing and potentially ruining your shot. However, if you get light like this, you’re going to have a good time. I wanted to get a little bit creative with my shot of the Hong Kong skyline so I tried something a bit different. I found this walkway up to the viewing platform and shot the crowds in front of the platform with the cool lines. Obviously, there are other alternatives. 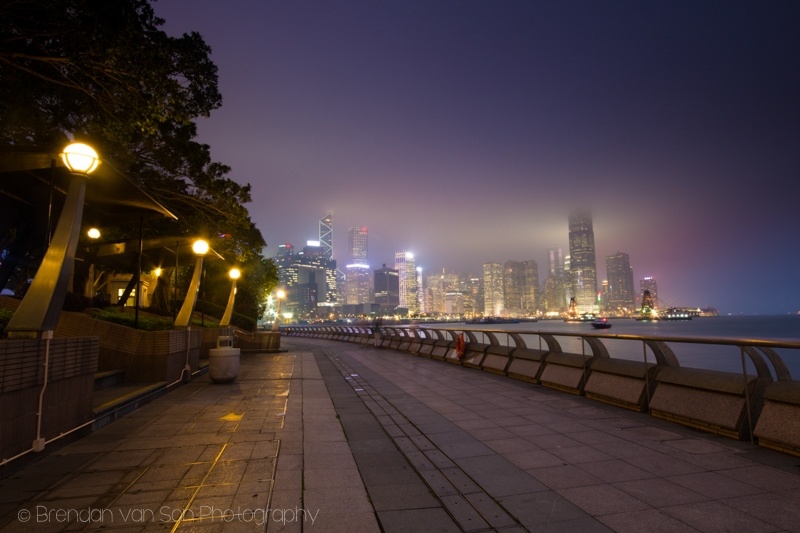 If you have some, I’d love to hear what your favourite places to shoot the skyline in Hong Kong from are. I hear a lot of people saying they like taking photos from the ferry. And while that’s completely true, it really only works to take simple photos as the boat is obviously moving. If all you want is a smartphone photo, then the ferries are actually a great way to get a cool vantage point of the city. Thanks Drew! And will do! Nice article, love the shot of the viewing platform the most. Which settings/lens did you use for these shots? What time were you shooting? Was it fully dark? Thanks man. Love the blog name, by the way! Ha! I should have added the data I guess, eh? I usually shoot skylines at about f/11 and 20 seconds, but it depends on the light. For me, the best time to shoot skylines is in the blue hour. Watch the sky one day after the sun goes down. About 30minutes after sunset in dusk it goes really blue. For me, that’s the best time to shoot skylines. That’s exactly when I shot the skyline of Hong Kong on all three of these occasions. The Data is always really handy for people like me, I decided about a month ago to only use Manual until I understand everything my camera does 100%, so it’s great to know what settings professional photographers are using and why. Best of luck with the new youtube channel too – it’s a great idea, everyone wants to improve their photography these days. The way you click is amazing. may be you cant try india also! though I know it will be very hard over here but there are amazing monuments and historical places that you can capture. Moreover a man like you will make a hell look like a heaven! Great photos Brendan. I was reading something the other day about all the different angles that are good to get skyline shots. There are so many! I can’t wait to visit and photograph it myself. You’ll love it Jen. There’s more angles at the Hong Kong Skyline than any other I know.